It all came down to a Friday finale in Dakhla with the strongest wind all this week, blowing right off the point as the quarter-finalists reared into action. By the 2.30pm the wind was steady cross-shore as Mitu Monteiro took on Filippe Ferreira first, linking silky smooth turns and always picking the best waves on offer. Filippe lost valuable time when his kite inverted but managed to get back out to find one more and nail a nice wave 360. He couldn’t match Mitu though and, for him, the competition was over. Moroccan shredder Ismail Adarzane and Aussie ripper James Carew took to the water. Carew focused on the waves while Ismail went for powered rotations and savage assaults on the lip. 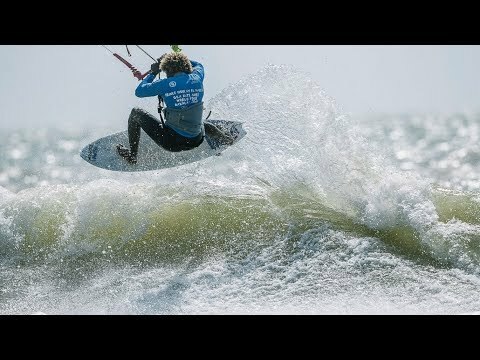 Carew progressed through to the semi-finals before Paulino Pereira beat Camille Delannoy in a strapless freestyle showdown. Next came the most hotly anticipated heat of the day between Airton Cozzolino and Keahi de Aboitiz. Airton’s looked virtually unbeatable so far this season, but Keahi beat Airton in the Dakhla final last year and confidently launched a relentless assault in this quarter final, taking wave after wave before pulling a 540 shuvit out of the bag – something not yet seen in competition. Airton responded with a salvo of aggressive hacks and freestyle tricks, including the infamous 313 but, after a tense wait, Keahi got the nod and the semis began. James and Mitu were first out and, while James never held back, Mitu’s ceaseless barrage of smooth, calculated riding was too much for the Australian. Keahi and Paulino then headed out to vie for a slot in the final and Keahi struck early with a huge kite loop board off before Paulino landed an unreal wave 360… which Keahi responded to with the wave of the heat. Both riders wasted no time in getting points on the scoreboard. Keahi struck first with a super smooth front roll before Mitu fired into a silky smooth wave 360, a 360 board spin and a big crazy horse close in to shore. Keahi came back with a big grabbed back roll and an outrageous cutback towards the heat’s end. It seemed impossible to call but, when the news came through that Mitu had clinched it, everyone was thrilled to see him take the event at the very spot where he won his world title back in 2008!